Tiffany lamps were originally made by Louis Comfort Tiffany who was a painter working in the 19th century. He was admitted to the National Academy when he was 23 and was the youngest ever member. He started working with colored glass in the 1870’s and made many stained glass windows for churches, often using flowers and plants in his designs. Following on from this he teamed up with two other artist to found Louis Comfort Tiffany and Associated American Artists, a company specializing in glass windows, a prime example of which can be seen in the White House. The company was dissolved in 1885 and he started the Tiffany Glass Company, alone this time. This later became the Tiffany Studios which made Tiffany lamps until the beginning of the 1930’s. When Thomas Edison invented the light bulb in 1879 he was inspired to make glass lampshades, drawing on his experience with stained glass windows and incorporating the flower and plant designs he had used for them. He also used the same methods as he had used for the windows, making paper patterns of the design and using these to cut the glass pieces, edging the pieces with copper foil and soldering them together to construct the lampshades. He patented the Nautilus lampshade, a shell shaped design, and included this when he staged his first exhibition in 1899. 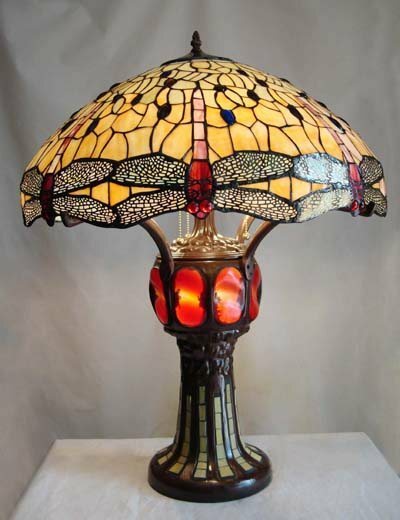 Today Tiffany lamps and lampshades are still made to Tiffany’s traditional methods. The lampshades are made from many pieces of coloured stained glass soldered together to make designs which include flowers, dragonflies, butterflies and also more abstract designs. Tiffany Lamps consist of five different design categories, one of which is Geometric Design. To better understand these designs it is imperative that you understand that Geometric designs encompass the shapes used in geometry such as, squares, rectangles, circles and triangles. Geometric Designs are typically very symmetrical, incorporating a repeating pattern. Some of the Lamps within this category consisted of simple designs such as: plain squares, parasol and straight panels. 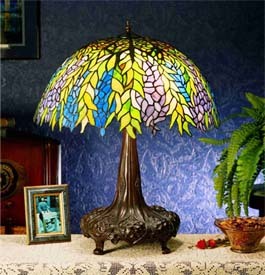 The only thing that sets these plain designs apart from other lamps is the use of Tiffany colored glass. Although many of the Tiffany Lamps geometric designs are very linear, Louis Comfort Tiffany managed to make some awe-inspiring pieces using these plain and basic shapes. The Nautilus Seashell is one of these lamps. Using only squares and rectangles, Tiffany managed to design a beautiful seashell lamp that is worthy of Captain Nemo’s ship in the Jules Verne favorite 20,000 Leagues Under the Sea. Another geometric design that is very unique is the Spider Web. The lamp shade is composed solely of rectangles. What sets this lamp apart from the rest (besides the beautifully colored-glass) is that a spider adorns the top with its eight legs stretching down the sides of the lamp shade. The Lotus leaf is yet another famous Tiffany design that baffles the mind when it comes to its geometric design. Consisting of only squares and triangles this Tiffany shade raises and lowers like an accordion all the way around with soldering effects that cannot be described with mere words alone. Another attribute that is unique to the Lotus leaf design is that the lamp shade slants downward at an angle part way before it curves outward, cupping the light. The geometric designs of the Tiffany lamps prove that there is nothing boring about squares, rectangles, circles and triangles. Louis Comfort Tiffany used these basic shapes to prove to the world that there is no limit to what the imagination can do with limited resources. The traditional method takes many hours of careful work. First a wooden model of the required Tiffany lampshade is carved, covered in glue, and paper or linen is laid over it. The design is then drawn on the paper/linen, the lines representing each small piece of colored glass which will create the design, notation is added to specify the color of each piece. When the design is completed the paper/linen is taken off the model and cut along selected lines so it lays flat and becomes a two dimensional pattern. Each area is numbered to identify it, the design traced onto another piece of paper as a reference for later assembly of the lampshade, then the original is cut into all the separate pieces, which are used to cut the small pieces of colored glass. The design is then built up by applying adhesive wax to the wooden model and pressing each glass piece into it, following the reference plan. When the whole lampshade is assembled the glass pieces are removed individually, edged with copper foil and soldered back in place. The whole thing is then heated to melt the wax and allow the lampshade to be removed and the inner edges to be soldered. If required by the design metal trims are soldered to the to and/or bottom edges, before the lampshade is attached to a metal (often bronze) base.